UPDATE: This restaurant has ceased operations as of August 2015. However, the review will remain on my blog as a form of reference for readers. Thank you. My summer break has been really hectic yet fun so far. Struggling with internship, birthday & CNY preparation and meeting blog deadlines are not easy at all! But I do enjoy it. And I'm really thankful to the other bloggers and Kim yet again for inviting us for another food tasting event at Toast Box, Taman Johor Jaya! For someone who doesn't take breakfast regularly, I sure was excited for this review! It's not my first time there, and I'm sure a lot of you have heard of Toast Box. They are from the same company as Bread Talk, both from Singapore! Bread Talk has the best floss bun! :9 With over 10 years of history in Singapore, Toast Box and Bread Talk have started expanding to Malaysia in the past few years. Currently, there are 90 branches worldwide, 60+ in Singapore and 7 in Malaysia - five in KL, two in JB. Have you seen any Toast Box booths in most Aeon foodcourt in the past? They have thus altered their concept and are now operating in food courts in other major malls. The concept of conventional Toast Box is to rent a small lot in malls and they are usually self-service. Toast Box @ Taman Johor Jaya, JB is the first ever and biggest one in Southeast Asia! It is located at a corner lot and they offer table service here! Plus, there is free Wi-Fi and sufficient seating so you don't have to be cramped up in a small space like in malls. The other Toast Box in JB is at KSL City Mall. However, you might think that the price in a spacious, corner shop lot will be more expensive right? You're wrong. The prices of food here are actually 20-30% CHEAPER than the Toast Box at KSL! Nice environment, cheap & good food, what more can you ask for? The place is crowded as it was a Saturday morning. There are three interior concepts for Toastbox- the traditional Nanyang concept, British Colonial Old English style and this particular branch is Modern Rustic. So dreamy and pretty huh? White makes everything looks so pure and clean. I love the big windows with sufficient sunlight streaming in! Don't even need to adjust my DSLR setting much cos the natural light was so perfect for photos. Check out the cool coffee machine. Toast Box uses traditional Nanyang coffee beans and blends it for your aromatic cup of coffee! Randomly picked this outfit and surprisingly it matches the dreamy theme of the cafe! The cover of the menu is designed to look like coffee stains. Creative! After walking around taking photos, we were all hungry. Now let's move on to the food and drinks! Roasted and grinded with Nanyang coffee beans on the spot. The milk to go with the coffee is specially made too! I can't drink coffee but this smells so aromatic. Soothing for the throat and very refreshing! The sweetness is just right. I like the chewy aloe vera and aiyu jelly bits inside. One of the recommended food. You can also opt for wholemeal bread for an additional RM1. All thick toasts here are about 2cm thick. Not sure if they usually slice the toast up like this, or it's only for our food tasting purpose. But anyway, this was quite enjoyable. The peanut butter is not too sweet and doesn't stick to my teeth, which is what I liked about it. We were so busy being #asiansatwork that the butter melted already. XD This is a rendition of the HK-style French toast; bread fried in oil and paired with butter, kaya and honey drizzled on top. I don't usually fancy toast like these as I find I get sick from eating too much... Jelak, you know? This is not as thick as other french toast and it's not as oily, so I found myself actually enjoying this! Of course, it only tastes super good if you eat it while it's hot. Another one of their famous toasts. The most basic and wholesome Malaysian breakfast; smooth butter and kaya in between two slices of toasted white bread. Look how evenly toasted the bread is, and how thick the butter and kaya spread is! I really like the bread. Fresh from the oven, one bite and you can hear the crunch. A must-have! Would be wonderful if the butter was solid and cold, like how it was prepared in the olden days... Ahh miss that taste! Golden fried pastry puffs stuffed with curry potato, chicken bits and egg filling. The curry puff is large and not too oily! And just look at how packed the filling is. Quite spicy, and I love the fluffy pastry skin. A highly recommended Malaysian dish. The curry is cooked with santan, paired with tofu, potato and juicy chicken drumstick. This is the only branch that serves drumstick instead of chicken wing as it is more meaty. The chicken is so tender cos Toast Box insists on buying it fresh from the market every morning. I like the potato too, as it has been cooked quite long in the curry, so it has soaked up the gravy nicely and is quite soft yet dense. You can also opt to pair this with baguette instead of rice. I personally do not like mee goreng but I tried this out anyway. It's oily, but there are a lot of cabbage bits in it, giving it a more crunchy texture. I find their rendition of mee goreng has a bit of sweet aftertaste? Plus point is there are two HUGE prawns! Also bought from the market daily, so its very fresh! Mee tai mak is actually something like coarse rice noodles. The noodles give the dish a more chewy texture. According to the operations manager, the recipe is the same as in Singapore. For me, it tastes like Singapore laksa because of the coconut milk, but it is watery like Johor Cathay Laksa. Taste wise, it is still fragrant and flavourful. Again, it comes with two unshelled big prawns to keep its freshness, tofu, fish cake, egg and some garnishing to go with the rich soup. I give this a thumbs up! We were just chatting after the meal when someone brought up Malacca Nyonya-style mee siam and guess what, they have it at Toast Box too! So Janet prepared big big bowl for us. XD A different take on your usual dry mee siam. This has springy meehoon paired with fish cake and some other condiments which are then soaked in sour and spicy gravy. Even though we were already very full, everyone liked this dish because it is very appetizing. Tastes even nicer when you squeeze some lime juice in it. Needless to say, this was my favourite dish of all! No need to go all the way to Malacca to eat it already! Dessert time! Surprised that a breakfast place like this sells cake? Have some fluffy and freshly baked banana cake to finish off your meal! The colour looks abit ombre-ish, right? It's the size of a large muffin! I only took a few bites but I found it to be soft and sweet, with a subtle pandan fragrance. Yum. Btw, this is my fave shot of the day lol. Hmm.. Somehow this swiss roll tastes different from others that I've tried before. I think the buttery smell makes it more fragrant and the cake is also soft, with smooth, light cream in it! Group shot! 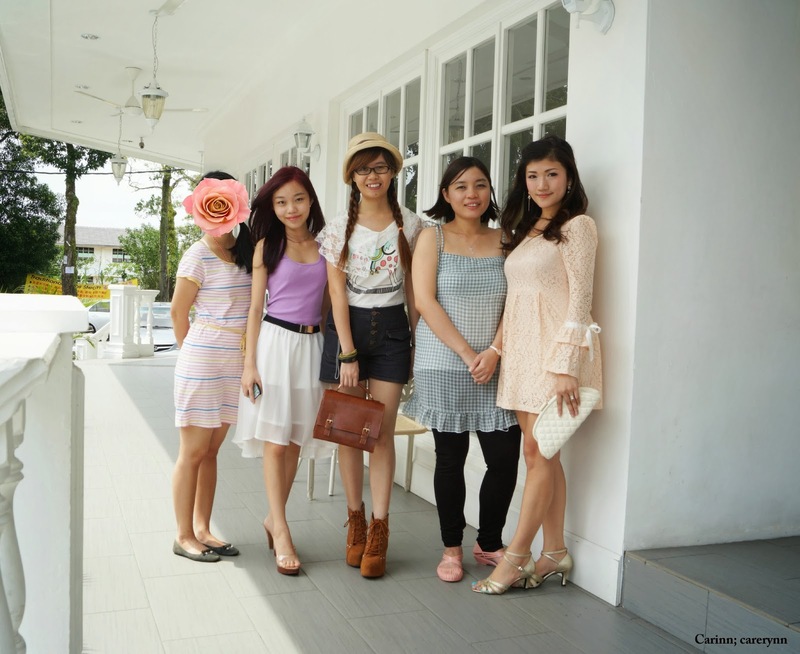 Ler Ler, Princess Neverland, Kim and Eryn! 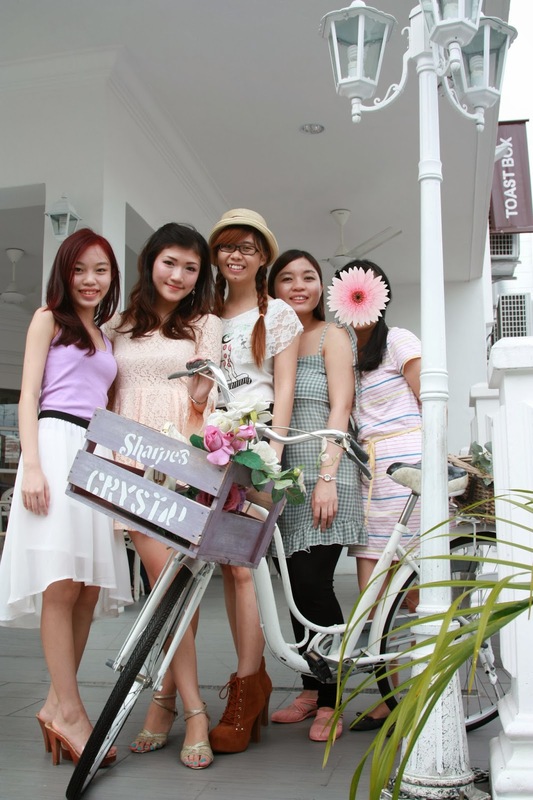 Check out their blogs on their Toastbox reviews too! Photo credits to Eryn's hubby, Kelvin. Yeap, I dyed my hair red and purple. :D So bright under the sunlight. Thanks to my bf for fetching me there and waiting patiently for 2 hours while we were reviewing! Toast Box is a pretty awesome place for families to gather on weekends. It's relatively relaxing because of the decoration and the crowd is less noisy as there are sufficient space. As it is not crowded, I would want to come back again for breakfast, lunch or tea. There is also an outdoor dining area where smoking is allowed. Oh, and they are very considerate too seeing as they have prepared a Nursing Room for mothers with babies! Very-family oriented place. A tip is to order their Toast Set or Asian Delight Set as you get the same good food and drink for a lower price! Drop by your nearest Toast Box for breakfast or lunch now! They have ongoing value sets to satisfy your cravings without burning a hole in your pocket! 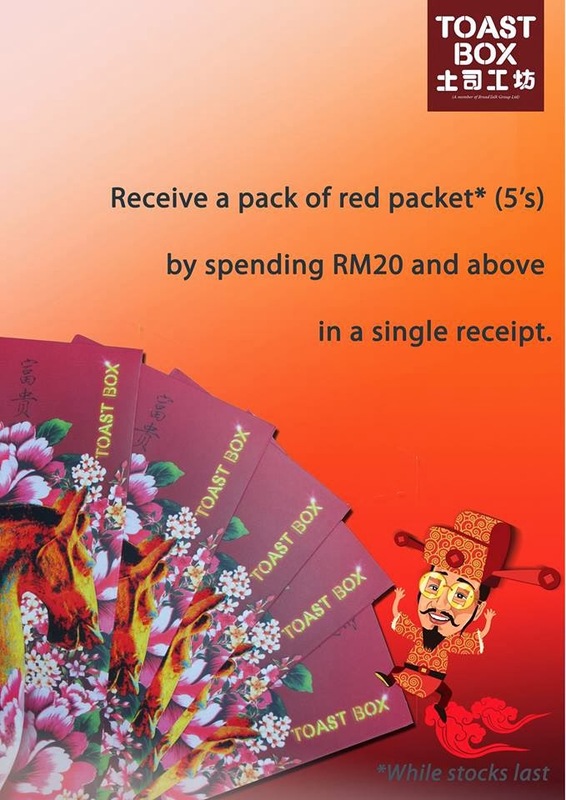 Spend RM20 and above and receive a pack of 5 red packets from Toast Box! *While stocks last. 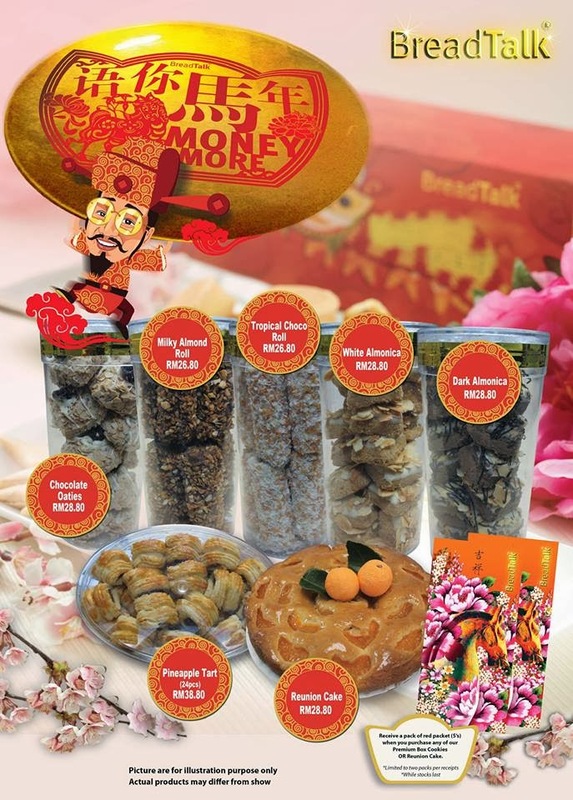 Have you bought all your Chinese New Year goodies yet? If not, why not consider dropping by your nearest Bread Talk outlet and try out their CNY cookies and cake! Sooo many choices, so affordable! So pretty, huh? There'll be a few branches opening in kl this year, hope they're just as pretty!